The long forgotten laundry room has been getting some well deserved love lately; and for good reason! Why should the most dreaded, time consuming chore take place in the darkest, dullest place in the house? Making your laundry room a fun place to be just might make doing laundry a little more manageable! 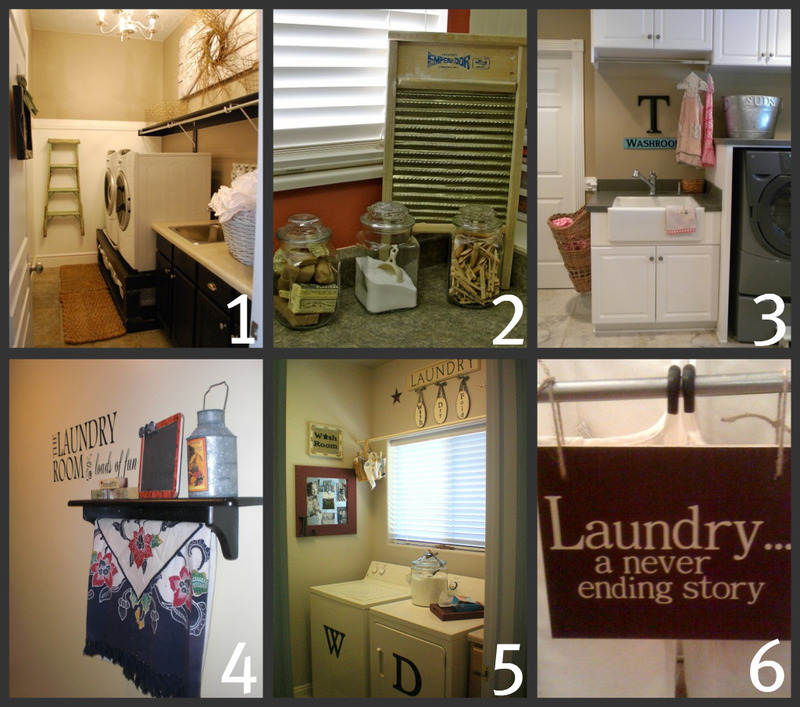 Here are some laundry room redo's and decor ideas we love! 1. Love this room @ SHOW & TELL, especially her DIY custom built washer/dryer cabinet! 2. AMAZING mud room over @ MONKEY SEE-MONKEY DO, I hope some day my husband grants me one of these too! 3. Vintage charm meets modern day convenience @ THREE PIXIE LANE. 4. Beautiful redo over @ THE PUMPKIN PATCH, she spray painted her cabinets, genius! 5. If this were my laundry room, you would probably find me outside rubbing my clothes in mud just to have an excuse to wash them! Check out all the adorable details @ LARSEN LOVES. 6. This sign @ RENTERS NO MORE made me smile, SOOO true! • the washer/dryer will pay for themselves over their lifetime in $ saved on your energy bill. • the water saved over the washers lifetime is enough to fill 3 backyard pools! • they use less detergent. space, allowing you to do fewer loads! • Paint your laundry room a color you love, making it a more desirable place to be! • Baskets, baskets, baskets. The more organized you are, the quicker the job will go! • When choosing flooring for a laundry room, avoid wood flooring and ceramic tile, go for something durable like porcelain tile (unglazed to prevent slipping when wet). All I've ever really wanted in my laundry room was a big wash sink and a nice counter to fold on, but I think my wish list has grown a tiny bit after seeing these amazing spaces!!! Great post. Thanks for sharing so many great laundry rooms. I recently posted about my laundry room. I have to admit, it really does make laundry more fun when you love the space. Way to go Jen! That is awesome...I do love your laundry room.